Whilst browsing some of my favourite shopping sites last week, I happily stumbled across this newbie on the Blank Canvas Cosmetics website, and within seconds, I made it mine. I've been playing around with this for the last few days and I'm ready to report back like the good lil' blogger that I am. I've really been experimenting with contouring in recent months and I usually opt for powders. I wanted to expand my contour horizon and this palette seemed like the ideal way to do it. 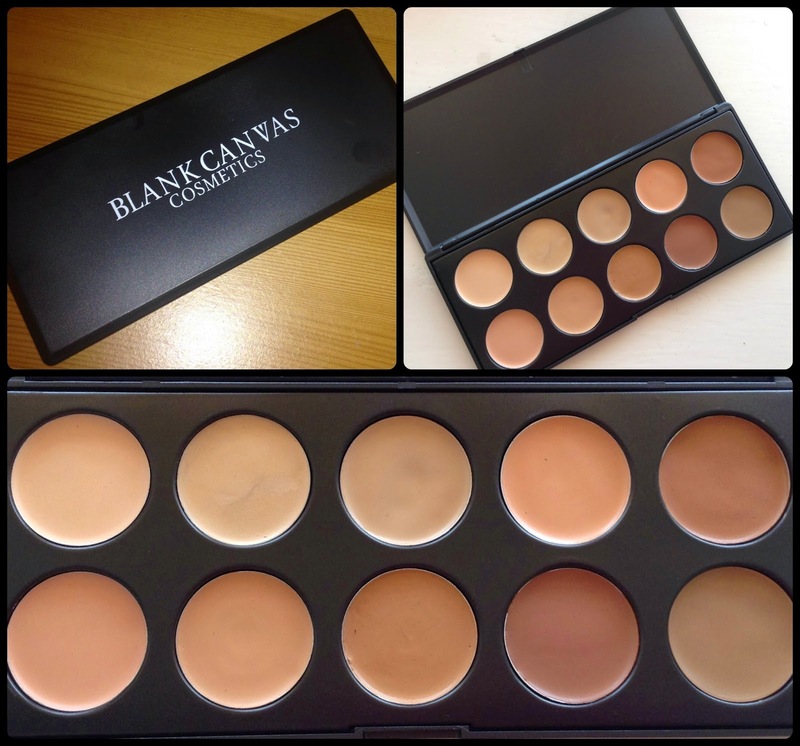 This Cream Concealer/Contour palette is available to purchase from the Blank Canvas Cosmetics website and can double as a concealer or contour palette depending on your skintone and preference. I doubt I will ever use it for concealer but I didn't get it for that purpose. There are ten shades as pictured. The pans are a decent size and the palette itself is sturdy and lightweight, perfect for travel or makeup kits. The shades are both pink and yellow toned so I think this would have universal appeal. I used my F23 (pointed kabuki) the colour on the top left for highlighting my undereye area, chin, forehead and down the bridge of my nose. The shade wasn't a million miles different to my own foundation colour (Nars Sheer Glow in Deauville) but it was still sufficient to highlight. I then used my F30 to apply the middle colour on the bottom row as my contour- I loved this shade for contour- the perfect daytime shading I think. I also used the F30 to shade the sides of my snoz to make it look a bit narrower.I blended the highlighter in with my F18 (short duo-fibre) and then used my beloved F20 (flat top kabuki) to buff everything in. The creams were extremely creamy and pigmented and blended incredibly well. I don't feel the need to set them with powder and I can testify as to their longevity. They didn't disturb my foundation or look cakey on my face once they were blended properly. If I had tan on and was heading out on the town for the night, I probably would have gone with a darker contour, and there are darker options in the palette. 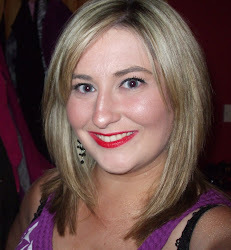 Similarly, there are lighter options than the colour I picked if I'd like a more subtle contour. I love this palette already- particularly because people who would never comment on my makeup have actually complimented me in the last week, and I'm not doing anything else differently so I have to give this palette the credit! Before getting this palette, I probably would have said that I couldn't get away with cream contouring for day time looks, but as you can see from the look above, it's perfectly day time appropriate. If contouring is something you are thinking about experimenting with, you should definitely consider trying out this palette- I'm very pleased with it and I think it was a sound investment of €14.24. I might even be converted from powder to cream contouring now. Is this palette something that you might be interested in? 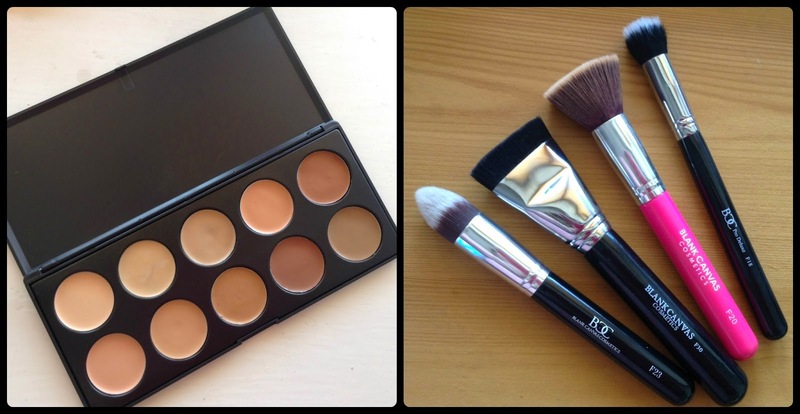 Are you a cream or a powder contour-er? A bargain price! Looks good!